With so many jewelers in Beverly Hills, it's difficult to single out a single favorite of the Hollywood set, but the 'House of Winston' has managed to guarantee itself an extra shot of Tinseltown publicity by providing many of the glittering diamonds that adorn the stars on Oscar Night - for free. When you see an actress at the Academy Awards dripping in jewels, chances are good that they are on loan from Harry Winston. Each year, the Rodeo Drive jeweler lends celebs over $200 million worth of glittering diamonds, rubies and other precious stones to wear to the Oscar ceremonies. He's been doing this since 1943, when he outfitted Jennifer Jones with her Oscar gems. Talk about trust... In 1999, Harry loaned host Whoopi Goldberg $41 million dollars in Elizabethian jewels (the most ever worn by one person at the Oscars) including a single diamond ring worth $15 million. Also in 1999, Best Actress winner Gwyneth Paltrow and presenter Jennifer Lopez also wore jewels by the House of Winston. Harry once loaned Elizabeth Taylor $3 million worth of jewelry for that single night. When TV's "The Bachelorette" picked out her engagement ring, it was at Harry Winston. In 2002, Oscar winner Halle Berry wore jewels from Harry Winston when she picked up her Best Actress Oscar; Best Actress nominee Sissy Spacek (diamond earrings and pearl bracelet), Renee Zellweger (large diamond earrings) and Glenn Close (necklace) also wore Harry Winston jewelry on Oscar Night. Hostess Whoopi Goldberg tells of how Winston loaned her a multi-million dollar yellow diamond necklace - and she lost it! Fortunately, she found the lost jewel - it had dropped down her bosom. In 2001, Harry designed a diamond necklace called "au Chocolat", made of white diamonds in a leaf motif with nine huge chocolate (brown) diamonds and 18 canary-yellow ones. He hoped to have Juliette Binoche (of "Chocolat") wear it, but she turned up in pearls instead! In 1997, Faye Dunaway wore $1.6 million worth of Winston jewels, including a 70-carat diamond & ruby necklace (worth $800,000), matching earclips (valued at $350,000), bracelets (worth $370,000), and a ruby & diamond ring valued at $80,000. Sigourney Weaver wore a ruby bracelet worth $614,000, and diamond earclips valued at $135,000. Winona Ryder chose only a pair of diamond earrings - worth $100,000. On the other hand, Bianca Jagger's diamond bracelet and earclips were worth over $1,000,000. The arrangement benefits both the stars (who get to wear the finest jewelry at no cost) and the jeweler (who reaps a bounty of free publicity each time a celeb mentions the store's name). But things don't always go smoothly in Tinseltown. When Winston loaned Sharon Stone a $400,000 necklace to wear to the Oscars, she claimed it was a gift and didn't want to return it. She later sued the jeweler for $12 million, claiming breach of contract. Most of Hollywood's elite have donned Harry Winston's jewels, including Katharine Hepburn, Grace Kelly, Jodie Foster, Madonna, Michelle Pfeiffer, Liza Minnelli, Gwyneth Paltrow, Dolly Parton, Rosie O'Donnell, Marisa Tomei and Laura Dern. When Whoopi Goldberg appeared as Queen Constantina in Disney's TV movie "Cinderella," Harry Winston supplied the jewels, including a 70-carat diamond ring valued at $9 million and a necklace worth $2.5 million. Winston sent three armed guards to the movie's L.A. set each day. When Kate Hudson appeared in 2003's "How To Lose A Guy in 10 Days", she was wearing an 87-carat diamond pendant (in the diamond gala scene) created especially for her by Harry Winston. And in 2003, when Ben Affleck bought Jennifer Lopez a huge, 6-caret, pink diamond engagement ring, he bought it at Harry Winston. And speaking of showbiz, Harry Winston also created a special pair of red ruby slippers to commemorate the 50th anniversary of "The Wizard of Oz." But as you might expect, Harry's ruby slippers, were a bit more expensive than Dorothy's... they were made of real rubies - 4,600 of them, to be exact, worth over $3-million. It's not just loaners, either. When Ben Affleck bought Jennifer Lopez a huge, pink diamond engagement ring, he bought it at Harry Winston - for over a million dollars. But expensive jewels are nothing new to Harry Winston. 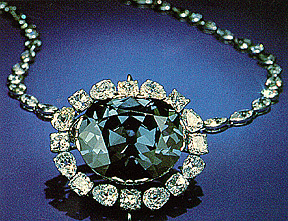 Known as "The King of Diamonds," the jeweler has made a specialty out of acquiring big stones, including the Taylor-Burton, the enormous 337-carat Catherine the Great sapphire, the 95-carat Star of the East, and the legendary 46-caret Hope Diamond, which Harry donated to the Smithsonian Institution. Over the years, the House of Winston has done business with Kings, Queens, Maharajahs, Sultans, famous families (such as the Rockefellers), and countless Hollywood stars. In 1974, he arranged the largest individual sale of diamonds ever, with an astonishing price of $24,500,000. There are other jewelers who also lend jewelry to the stars for the Academy Awards. One notable name is Van Cleef & Arpels (which is located on the same block of Rodeo Drive). But it is Harry Winston who usually manages to get the company name on the evening news on Oscar Night. Getting there: Located on the west side Rodeo Drive (across from Cafe Rodeo), in Beverly Hills.